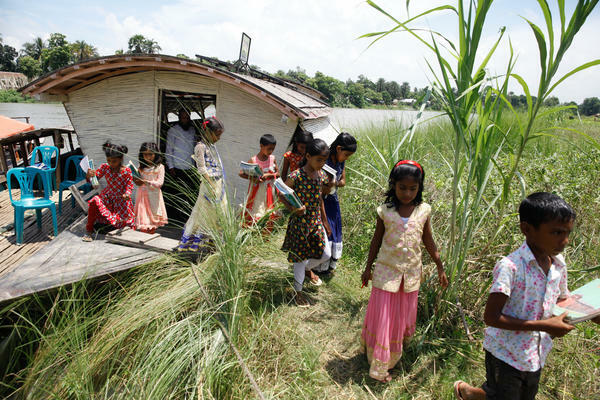 Third graders on board a floating school in Bangladesh run by the nonprofit group Shidhulai Swanirvar Sangstha. The boat has one classroom that holds about 30 kids. The walls are made of reeds. The lone computer runs off solar panels. The charity has a fleet of 23 school boats. They pick up kids along the river, then pull over into the marshy riverbank to hold class. Nila Khatun, age 8, and her teacher, Mafya Begum, during a lesson on the floating school. Rakhu Khatun, age 9, writes on the blackboard, which sits in front of the boat's engine. Mohammad Saiful Islam coaches a kid how to use a computer in a floating library run by the nonprofit group Shidhulai Swanirvar Sangstha. Mohammed Rezwan is the executive director of Shidhulai Swanirvar Sangstha, which has a fleet of floating schools and medical clinics in the northwest of Bangladesh. Villagers wait to see a doctor at a Shidhulai Swanirvar Sangstha floating clinic. On different days the boat docks at different points along the river. The floating library also has a playground with a slides on either side of the boat and a swing set on the top deck. The floating school has three sessions during the day, each for a different group of kids. She leads the class in a chant that begins with "6 times 1 equals 6" in Bengali. They end with "6 times 9 equals 54." 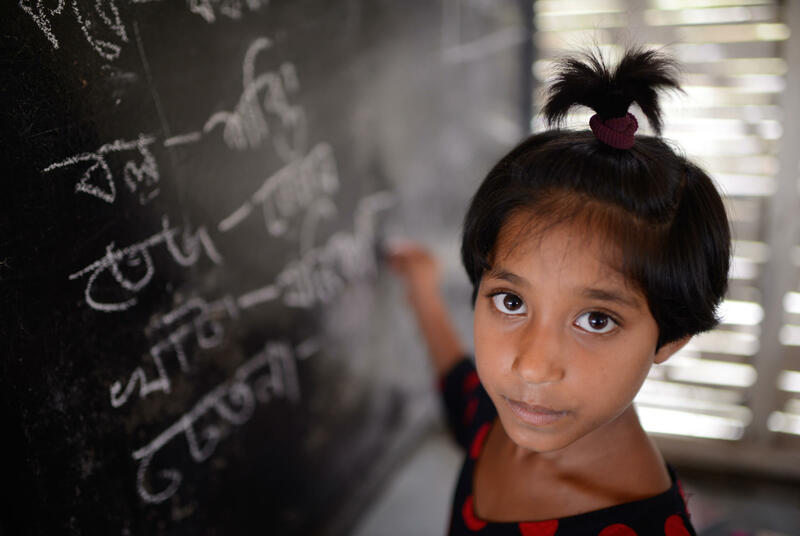 Educators in Bangladesh have a problem. 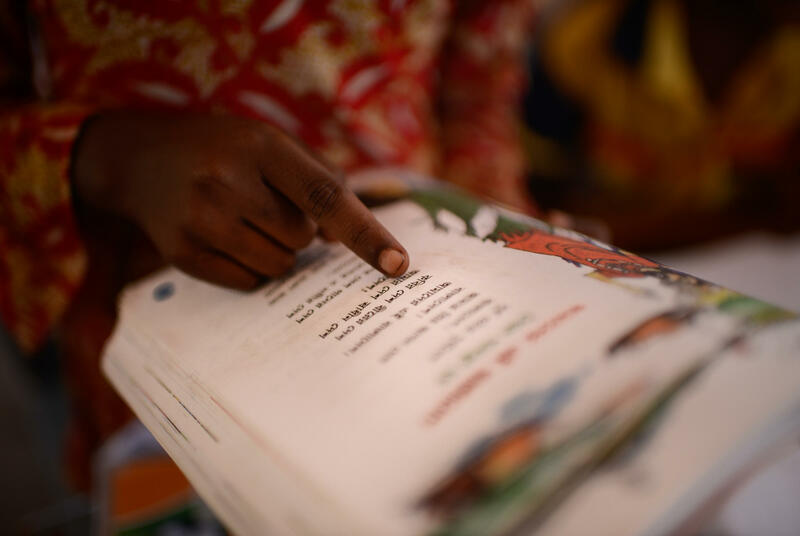 Not only do they face many of the same challenges as teachers in other resource-poor countries — funding constraints, outdated textbooks, overcrowded classrooms — they also have to worry about monsoon rains. 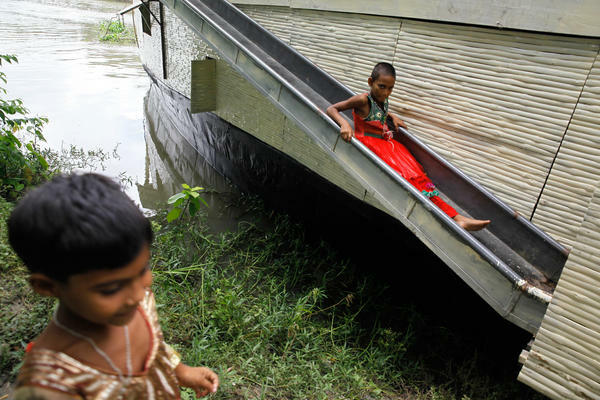 Flooding is so common in Bangladesh that students often can't get to the classroom. So one local charity has decided to take the classrooms to the students in the form of schools on boats. 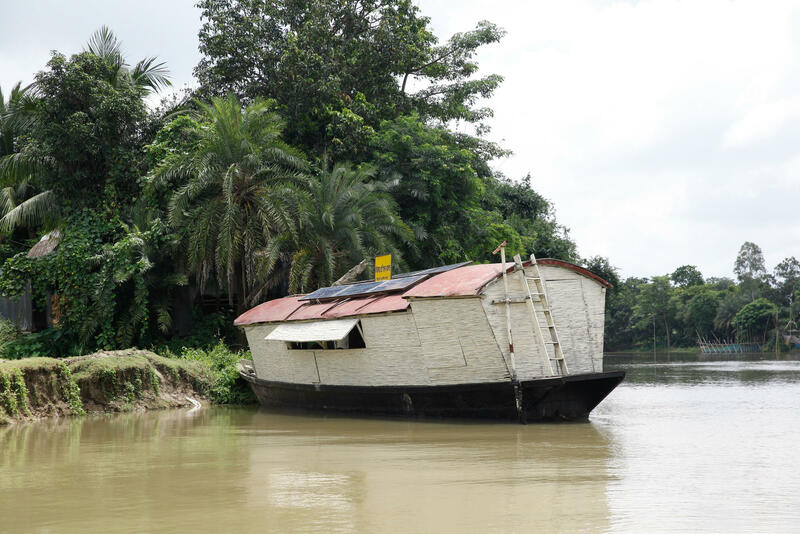 This boat is one of 23 floating year-round schools in this part of Bangladesh run by Shidhulai Swanirvar Sangstha, a local nonprofit group. Each morning the boat goes along the river picking up students. Once the whole class is on board, they pull over to the riverbank and school starts for the day. In addition to their standard primary school classes of Bengali, English, math and science, the students also watch a video about the adventures of Meena and her pet parrot, Mithu. Meena is an educational series developed by UNICEF and is the closest thing South Asia has to Dora the Explorer. In the episode that Nila and her classmates watch, Meena and the parrot foil a plot to marry off a young girl for a dowry of a motorcycle. Bangladesh is not only the eighth most populous nation in the world with 160 million people, it is also one of the countries most prone to flooding. The nation sits in a vast delta formed by the Ganges, the Meghana and the Brahmaputra Rivers as they carry brown sediment-rich water from the Himalayas out to the Bay of Bengal. Much of the country is less than 16 feet above sea level. In heavy monsoon rains, 70 percent of the country can end up under water. Mafya Begum, the lone teacher on the boat, says that during the monsoons, the local villages are cut off from the rest of the world. The roads end up under water and the only way out is by boat. Mohammed Rezwan, the founder of Shidhulai Swanirvar Sangstha, grew up in this part of Bangladesh. "If you visit these areas you'll find that during the monsoon season they get isolated," he says. "It becomes very difficult to have the normal life." 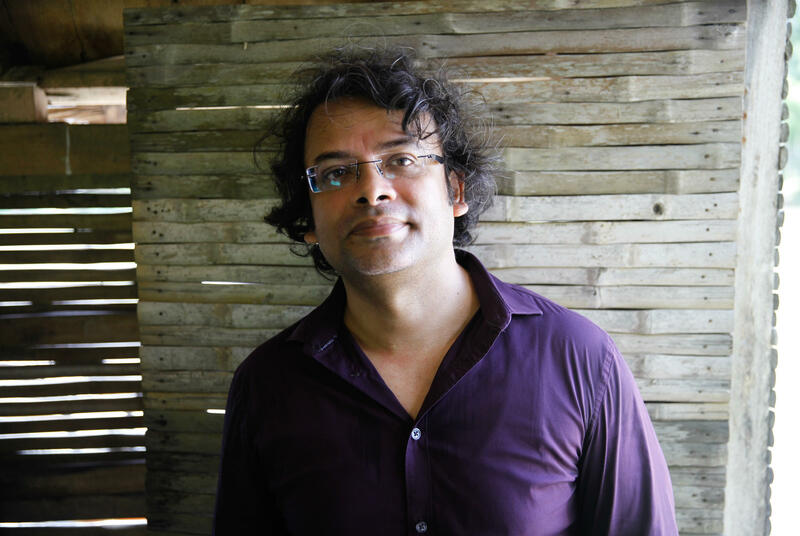 Rezwan started his first floating school in 2002. "If the children can't go to school for lack of transportation, then the schools should go to them," Rezwan says. "The idea was to ensure all-year-round education." 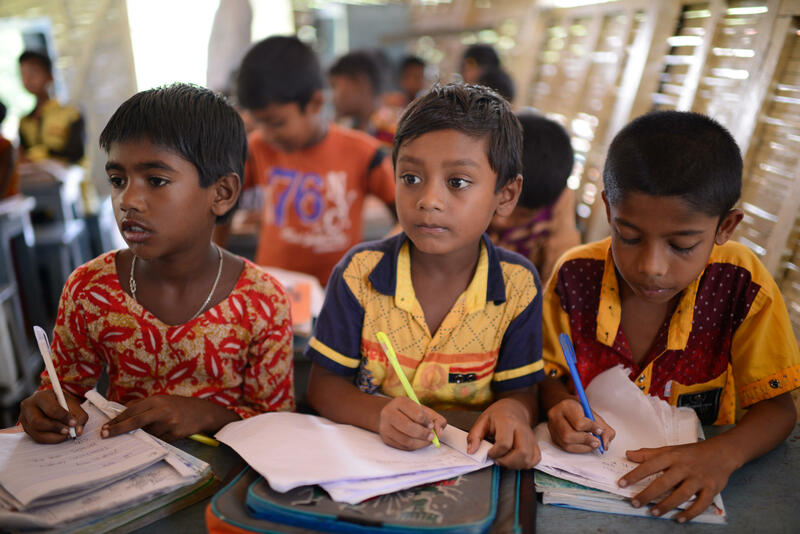 His nonprofit now runs 23 boat schools in this part of Bangladesh. Shidulai also operates five floating medical clinics and just launched a playground-slash-library that plies the rivers. All their services are free. Rezwan says Shidhulai pieces together funds from national and international groups as well as individual donors to pay for its programs. In 2005, Shidhulai won an Access to Learning Award for $1 million from the Bill and Melinda Gates Foundation (which is a funder of NPR and this blog). The group won a U.N. Prize for Inspiring Environmental Action in 2012. In 2006 UNDP honored Shidhulai with its Equator Prize and said the group is "transforming the region's waterways from obstacles to human development into pathways for education, information and technology." Groups like Shidhulai have helped Bangladesh make dramatic social progress over the last quarter century. 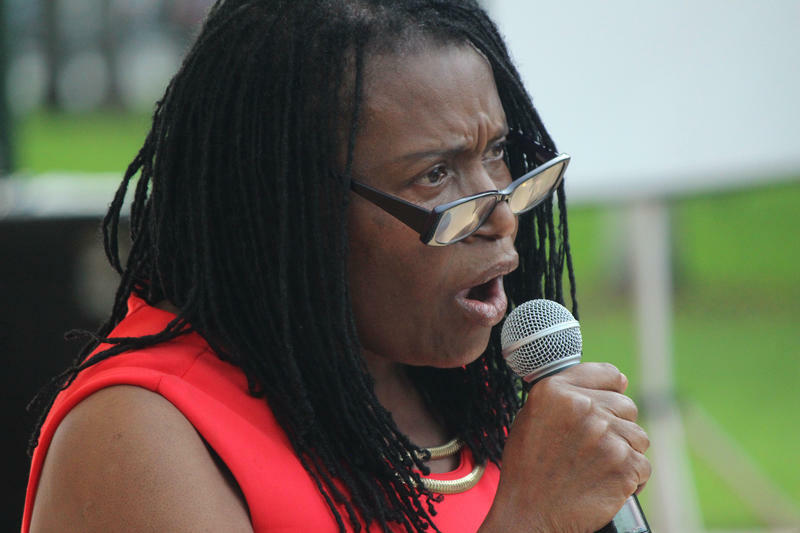 The country has cut its poverty rate in half since the year 2000. It graduated from being a "low-income" to a "lower middle-income" country in 2015, according to the World Bank. The economy is one of the fastest growing in the world. But much of that economic boom hasn't been seen in the rural backwaters of Bangladesh. 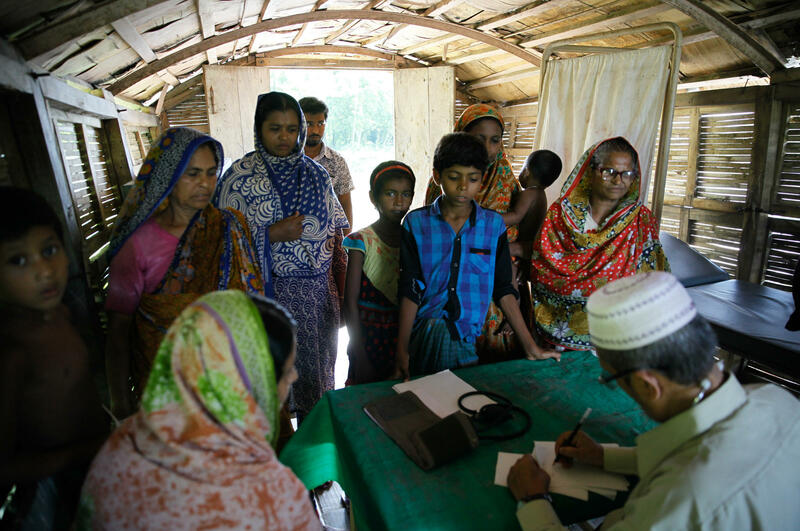 Rezwan says it's important to make sure that Bangladesh's annual floods don't keep kids from these remote areas from school and trap them in poverty. He refers to the floating classrooms as a combination "school bus and school room." After the morning session, the boatman fires up the diesel engine on the boat-school, delivers the students back to their villages and then picks up a group of older kids for the afternoon classes. Rezwan says the mobility of these schools has another benefit in rural Bangladesh. "In the rural areas. the parents are mostly concerned with the safety of the girls," he says. "If they [girls] have to travel a long way to go to school, then the parents would not let them go to school. But here the education comes at their doorsteps so they're not concerned about the safety." And that's true for the family of third-grader Nila. Her mother Musa Khatun says that if it wasn't for the floating school, Nila probably wouldn't be in school at all. "There's no school nearby," Khatun says. "There's a school far away. That's why they chose this boat school." Nila lives with her parents and her baby sister in a two-room house in a fishing village on the Atrai river. The walls are little more than woven reed mats. There's no electricity in the village except from some small solar panels that some residents have on their roofs. Khatun says that during the monsoons the village is only accessible by boat. Their family primarily survives by raising jute in the nearby plains. The long, fibrous plant is used to make burlap bags. Nila's mother, however, sees a different future for Nila. She says Nila is the smart one of the family. No one in their family has ever gone to college, yet Khatun insists her daughter is going to be a doctor. And Nila nods her head enthusiastically. And I'm Rachel Martin with a story about just how difficult it can be for teachers in Bangladesh. There's so much flooding in that country that students often can't even reach their schools. So one group is trying out a possible solution - floating the classroom to the students on boats. Here's NPR's Jason Beaubien. JASON BEAUBIEN, BYLINE: On the Atrai River in the northwest of Bangladesh, Nila Khatun is squeezed onto a bench with two other girls. From her seat in the fourth row, the 8-year-old intently follows along as the teacher leads the class through a math lesson. Nila copies a subtraction problem from the board into her notebook in front of her. On the starboard side of the boat, boys are jammed into another set of narrow benches and desks. Nila is one of 29 students in this third-grade class. When the teacher asks for a volunteer to recite a multiplication table, Nila's hand shoots straight towards the unpainted ceiling. BEAUBIEN: She leads the class in a recounting of six times five equals 30, six times six equals 36, six times seven equals 42. Nila woke up earlier that morning in a village that's across the river and a bit upstream from where the boat is moored. Her teacher, Mafya Begum, came to collect her from her village and ushered her on board as she does six days a week. 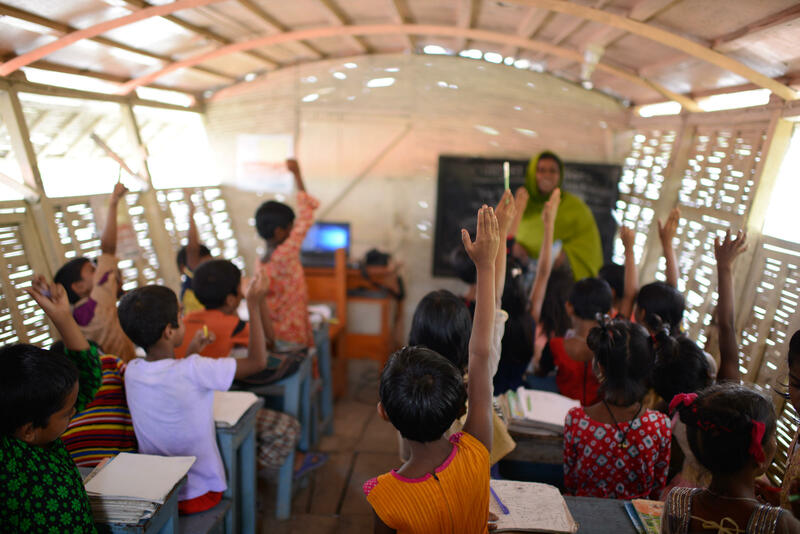 Begum says the students are eager to attend school, and one of the benefits of the floating classroom is that it can operate in any weather. MAFYA BEGUM: (Through interpreter) When it rains really hard, this village is cut off from the outside world. The roads end up under water. At that time, the only way out is by boat. BEAUBIEN: Most of the residents in Nila's village are farmers. Their primary crop is jute, which is a fibrous plant used to make burlap bags. Fishing nets line the riverbank. Narrow mud walkways cut between the reed-walled houses. There's an occasional motorbike but no cars. Mohammed Rezwan, the founder of Shidhulai Swanirvar Sangstha, which runs the boat school that Nila's been attending for the last three years, grew up in this part of Bangladesh. MOHAMMED REZWAN: If you visit these areas, then you'll find that during the monsoon season, they get isolated. And it becomes very difficult to have the normal life. BEAUBIEN: Not only is Bangladesh one of the most densely populated nations in the world, it's also one of the countries most prone to flooding. Much of Bangladesh is less than five meters above sea level. In heavy monsoon rains, 70 percent of the country can end up under water. Rezwan says he started his first floating school almost two decades ago to try to make sure that the annual rains didn't keep kids from getting an education and trap them in poverty. REZWAN: If the children can't go to school for lack of transportation, then the schools should go to them. So the idea was to ensure all-year-round education. BEAUBIEN: His charity now offers free classes on 23 boat schools to nearly 2,000 students. Over the last quarter-century, Bangladesh has made dramatic strides forward. It's cut its poverty rate in half since the year 2000. The economy is one of the fastest growing in the world. But that prosperity hasn't been felt in more rural parts of the country. 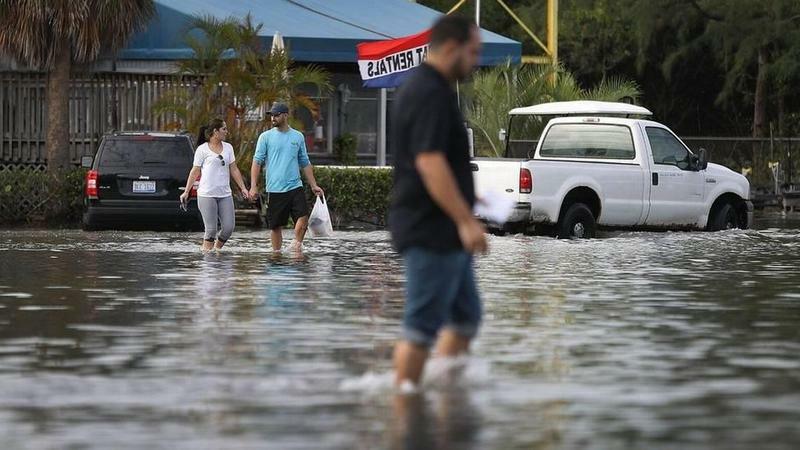 And places that are cut off by floods for months at a time have lagged behind urban areas in the development of water, electricity and telecommunications infrastructure. Rezwan says these areas also have fewer educational opportunities for girls. REZWAN: In the rural areas, the parents are mostly concerned with the safety of the girls. BEAUBIEN: Some parents won't send their girls to school if the girls have to walk long distances to get there. So Rezwan has the floating schools pick up the kids from their individual villages. REZWAN: Here, the education comes at their doorsteps, so they're not concerned about the safety and all those things. BEAUBIEN: And that's also true for 8-year-old Nila Khatun's parents. BEAUBIEN: After the morning classes, the boatman fires up the school's diesel engine. He putters up the river to deliver Nila and the other students back to their villages. Once he's dropped off the third-grade class, he starts picking up older kids for the afternoon session. Nila's mother Musa likes that Nila's teacher comes straight to her door to pick her up. And if it wasn't for this mobile classroom, Musa says Nila probably wouldn't be in school at all. 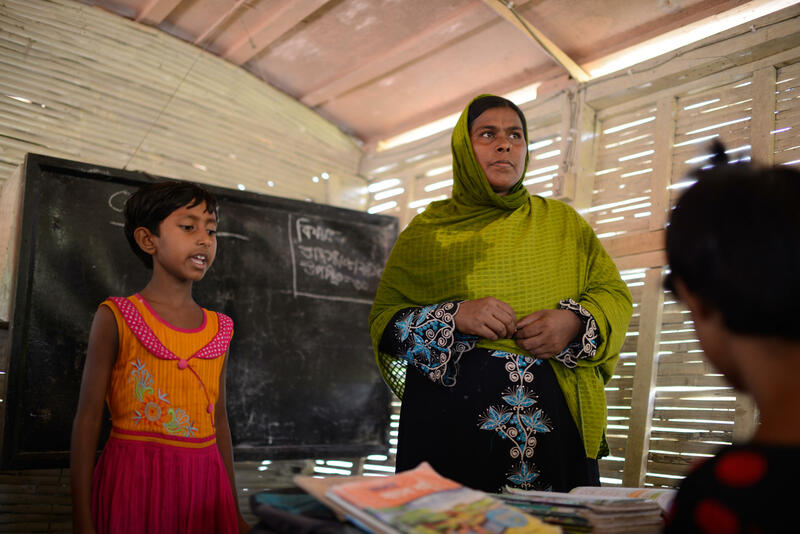 MUSA KHATUN: (Through interpreter) There's no other school nearby. There's one school, but it's far away. That's why we chose to send Nila to the boat school. BEAUBIEN: Like almost everyone else here, Nila's parents are farmers, yet her mother says Nila is destined for bigger things. No one in her family has ever gone to college, but Musa insists Nila is going to be a doctor, and Nila nods her head enthusiastically. Jason Beaubien, NPR News. Transcript provided by NPR, Copyright NPR.